Best place to watch the sunset in Brisbane? 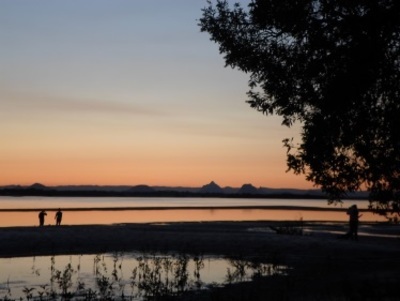 When I visited Bribie Island, I was impressed with the sunset over the water, with the Glasshouse Mountains silhouetted against the sky. It got me thinking, where would the best place to watch a sunset be? Reef Point, just on the tip of Redciffe Peninsular is easy to get to and a perfect spot for watching the sunset, and you may get to see dolphins too! 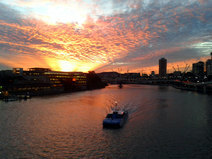 Brisbane is not that good a location for sunsets. You are right though head out to one of the islands to have a view of the sun setting over water, such as Bribie, and North and South Stradbroke islands. Other water destinations can include some of the lakes, such as Lake Samsonvale out near Petrie for example. I particularly like the sunset views over the Brisbane river, partly because I often find myself walking over one of the Bridges that go over the River around Sunset time. I also plan to take a friend to photograph the Story Bridge from Wilson's Outlook reserve at around Sunset. Best place to see exotic animals in Brisbane?